Here’s one of my favorite chile photos. 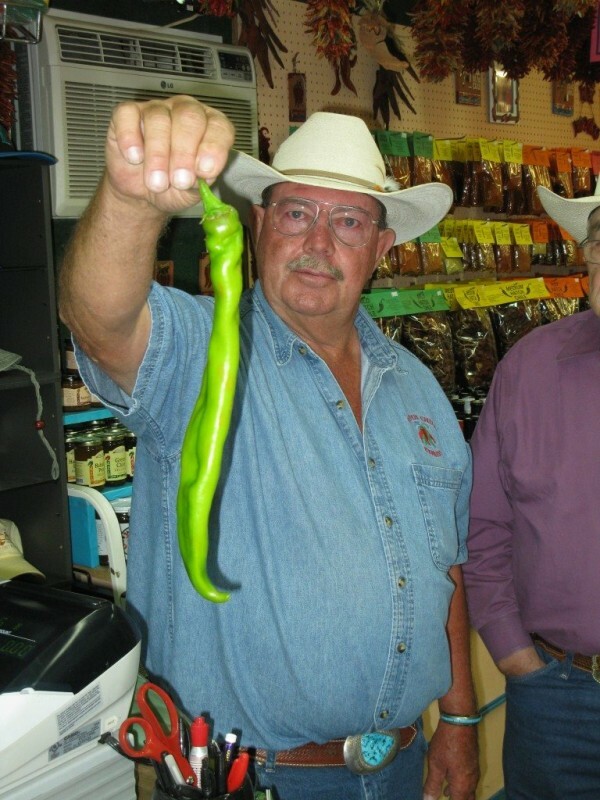 It’s chile grower Jimmy Lytle inside his wife Jo’s shop, the Hatch Chile Express, with a very long ‘Big Jim’ green chile. Jimmy’s dad, Jim Lytle, developed this variety and then turned it over to chile breeder Dr. Roy Nakayama for improvement. 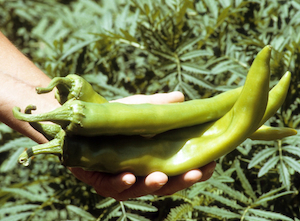 Released by Nakayama in 1975, ‘NuMex Big Jim’ is listed in the Guinness World Records as world’s largest chile (Nakayama, 1975). It produces long, thick, smooth, fleshy fruits. Mature green fruits are moderately flattened. The round-shouldered fruit tapers to a hook at the apex. Mature green fruit averages 7.68 inches in length and 1.89 inches in width. 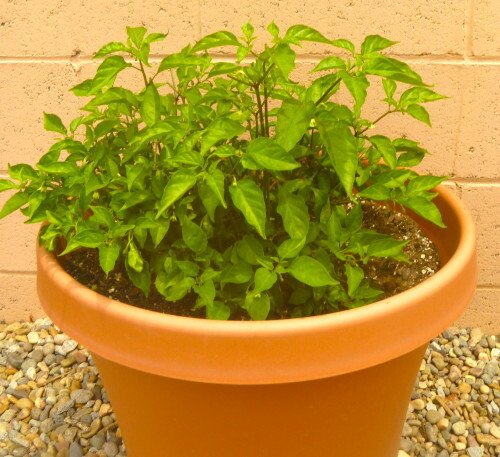 It has a slightly higher heat than ‘New Mexico 6-4,’ but not as high as ‘Rio Grande 21’ and ‘Sandia.’ Heat level varies from plant to plant, with some plants producing mild pods and others producing hot pods. Here’s another shot of ‘Big Jim’ pods.